Monira Al Qadiri’s works lend a highly political visual language to the experiences of the Gulf, articulating both the angst and the richness of the culture. The exhibition at ACUD is Al Qadiri’s first solo-show in Germany, encompassing a selection of recent sculpture and video works. In her earlier works, the artist experimented with questions of gender and performance. She created images and videos using representations of her own body, presenting herself as male characters, and having male dancers play female roles in videos portraying traditional Arabic music. These works relate narcissism, gender roles, and melancholy—highly figurative and sumptuous depictions of Arab Culture. Her most recent pieces continue to work through the same cultural spectrum but with particular consideration to economic histories and tradition. The title of the show, “Bubble,” refers to both liquid crude oil—its effervescent and iridescent nature—and the term “economic bubble,” relating to a bubble market, or a trading of assets whose price is incongruous with its intrinsic value. The video projection Rumors of Affluence (2012) speaks directly to the latter, giving viewers an exclusive and voyeuristic look into the Kuwait Stock Exchange. Al Qadiri zooms in on different traders, men wearing traditional, long, white dishdashas, lounging aimlessly about the Stock Exchange, and presumably conducting business. Coupled with deeply percussive music building tension, the voice of the narrator—the artist herself vocally disguised as a man—recounts stories of wealth, consumption, and corruption before and after the financial crisis. The reveals another bubble: a world directed by men, of unimaginable wealth and fraud—a precarious bubble, ready to pop. The video Travel Prayer (2014) features found footage from a camel race, a popular sport and betting event in the Middle East. In the past, children were trafficked, and used as jockeys at races. Most Middle Eastern countries have now recognized the use of children as a human rights violation; and as a result, camels today are fitted with robotic jockeys, as seen in the video, that are controlled from SUV vehicles that ride along the camels. Al Qadiri invokes a subtle humor in her works that allows her to navigate sensitive political and cultural spheres, with sharp poignancy that renders absurd the corrupt and perverse. The video confronts the dark, traditional history of this sport by making the footage vibrantly colored, and accompanying the images with two sounds: a children’s tune as staccato as the camel’s galloping is fused with the words of an Islamic travel prayer. Merging together symbols of wealth, tradition, and religion, these parts create a critical portrait of the Gulf States, where child abuse is traded for crude machines. Al Qadiri’s pointed sense of irony is even more present in another video, SOAP (2014), in which she superimposes images of migrant domestic workers onto scenes from various Gulf Soap Operas. Domestic workers constitute an invisible presence in the immaculately manicured homes and lifestyles of characters on these television shows, yet in reality, these workers are a ubiquitous part of everyday life in most Gulf households. As a result, SOAP presents a surreal image and acerbic criticism of not only these soap operas, which themselves are cleaning and editing their depictions of reality, but also on a culture that is based in superficiality. As with Rumors of Affluence and Travel Prayer, SOAP continues to explore and expose the histories and experiences that are obscured in Gulf culture. Deep Float, (2017) the newest work presented in the gallery, provides different sorts of intimacy. A bathtub standing at the center of gallery, what would seem to be a private moment of self-indulgence and self-care, is perverted. 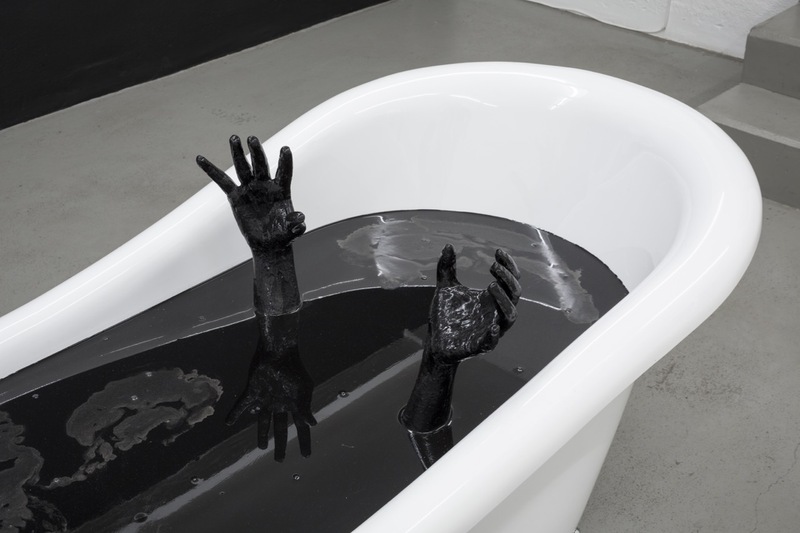 Instead, the bathtub is filled with a dark, nacreous substance portraying crude oil, while two hands seem to reemerge from the ooze. Both drowning and emerging from the muck, the absent body symbolizes the precarious and overwhelming economic reliance that the Middle East, and the rest of the world, have to crude oil. Monira Al Qadiri (born 1983 in Dakar, Senegal) lives and works in Amsterdam. Born in Senegal and raised in Kuwait, she left her home country at 16 and spent a decade in Japan, where she received a PhD in intermedia art in 2010. In 2011 she relocated to Lebanon. She is a founding member of the artist collective GCC, and is currently in residence until 2018 at the Rijksakademie in Amsterdam, Netherlands. Selected previous exhibitions include: Academy of Fine Arts, Vienna; New York University, Abu Dhabi; Haus der Kulturen der Welt, Berlin; Center for Contemporary Art, Warsaw; Kunstverein Dusseldorf; Maraya Art Center, Sharjah; Tokyo Museum of Contemporary Art, Tokyo. Al Qadiri’s video works have been screened at: Centre Pompidou, Paris; Safar: Festival of Contemporary Arab Cinema, London; Ludlow 38, New York; Whitechapel Gallery, London; Marian Goodman Gallery, Paris; Berlin International Film Festival, Berlin; New Museum, New York.